Yes, this is my third book of three with the Christmas theme! It has been so much fun reviewing Christmas books, especially reading them this fall!! It has been easy to transition to holiday planning!! Melody Carlson wove a beautiful story in this charming Novella. You can read all about Melody on her blog. This story takes place in the tiny town of Parrish Springs. This is another story that captures all the elegance of small town life! I love reading about little towns and how all the character know each other, I find it delightful to be known in that way. In this story a quirky lady, Matilda Honeycutt, arrives in their small town, and many people are intrigued, while many others are very upset by her presence. Matilda brings her own element to this story though, and as she meets the people of this town, she impacts them in a very unique way. This story offers the reader another quick read that will quickly get you in the Christmas spirit. Matilda embodies the true, and precious, meaning of Christmas! I loved seeing how this little old lady impacted this town, for the better! I would recommend this book as a great Christmas present for the reader in your life, or as a great treasure to enjoy yourself. When you check out this book, check out many of Melody’s other Christmas Novellas as well, I think you will be happy to read any of them! 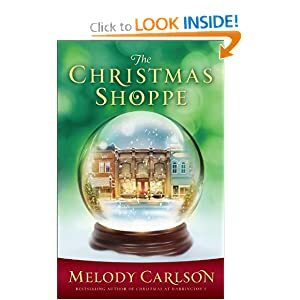 Note : I was offered a copy of The Christmas Shoppe in exchange for an honest review on this blog.